Last week we had a couple of requests to dive into the data with a regional focus. Today we will explore the insights we can gain by comparing survey data by region and finding how the socio-political climate in our regions add up with represented municipal leadership. In the US we are influenced by regionalism and can be characterized by the region where we were raised. Growing up in the South, my regionalism was demarcated by my use of y’all, my belief in southern hospitality, and my awareness of the Bible Belt and other conservative leanings of the South. Because I grew up in Atlanta, I was surrounded by diversity and multiculturalism. I gained an awareness of socio-political and socio-economic pressures that were less opaque to me than if I had lived in the smaller, homogeneously-conservative/white municipalities elsewhere in Georgia, or the South. If I tell someone I am from the “Deep South” the stereotype is usually contextualized through a rural/conservative lens even after I mention I am from metro Atlanta. All this to say, regionalism is not easily defined, yet regional identity has such a powerful role in our nation’s politics, media and entertainment, economic health, and social frameworks. We all have important and personal connections to “place”. Motivation to push for positive changes in our communities is because of this attention we have toward our own physical, cultural, and social identities that define a place (our place). Check out this great piece on placemaking. But before we hit the stats, I would like us to take a closer look at the definitions and evolutions of US Regionalism. Official regional delineations of the US are not always portrayed correctly in media and culture. Did you know that the US Census includes Delaware as part of the South? Washington DC, too? Or that Alaska and Hawaii are in the same region as Colorado? One can’t help but wonder how Hawaii could share any regional concerns with Colorado. Then there are the megaregions, clusters of dense metropolitan areas that are becoming a newly-defined regional grouping of their own (see map below). 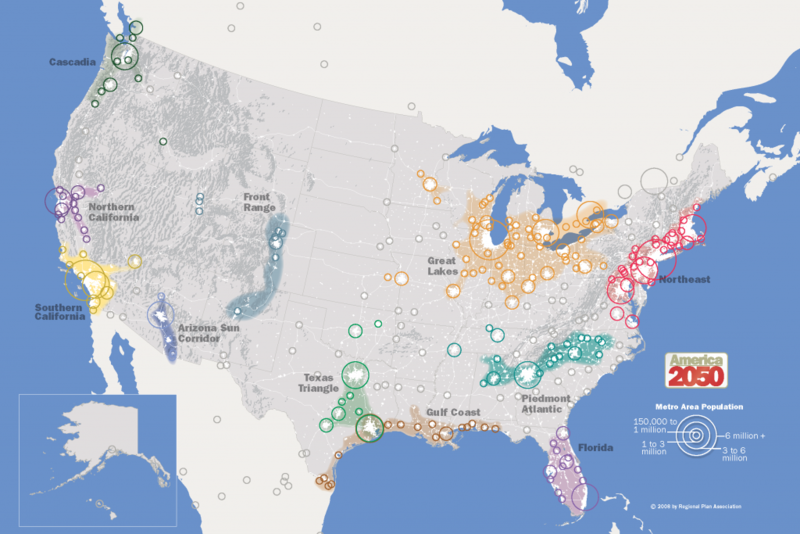 These major US metros are linked by common interests and shared concerns over specifically urban characteristics like infrastructure, land use and settlement patterns, economic systems, as well as environmental and topography issues. As we start looking into data, deciphering trends in the urban-focused megaregions will potentially hold some valuable insights. And how about our main geographical regions? Why are they always changing depending on who is drawing the map? Are there four? Five? Seven? Depending on the demographer and the data attributes being explored, a specific regional delineation chosen will directly affect the data narrative being told. 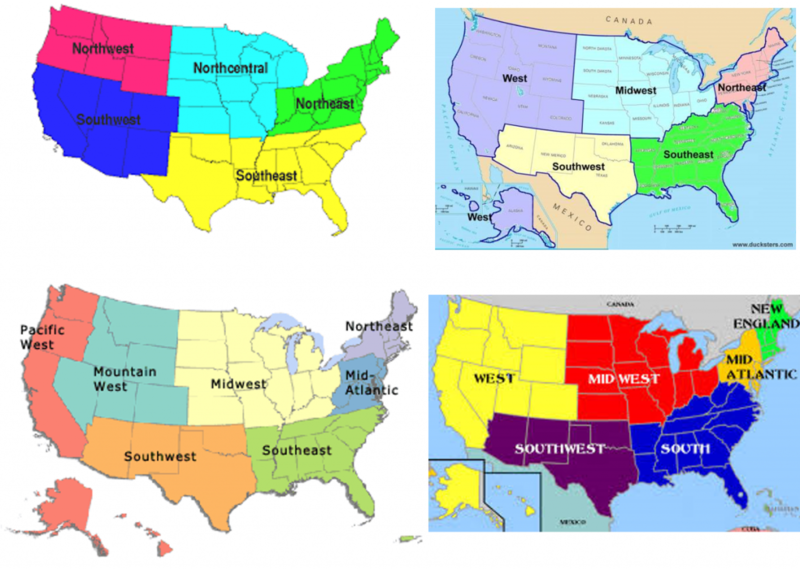 The four maps below are all official regional sets used by the US government. And they are all very different. We know that building data narratives must involve a methodology that uses shared language and metrics. So how should we define our regions? 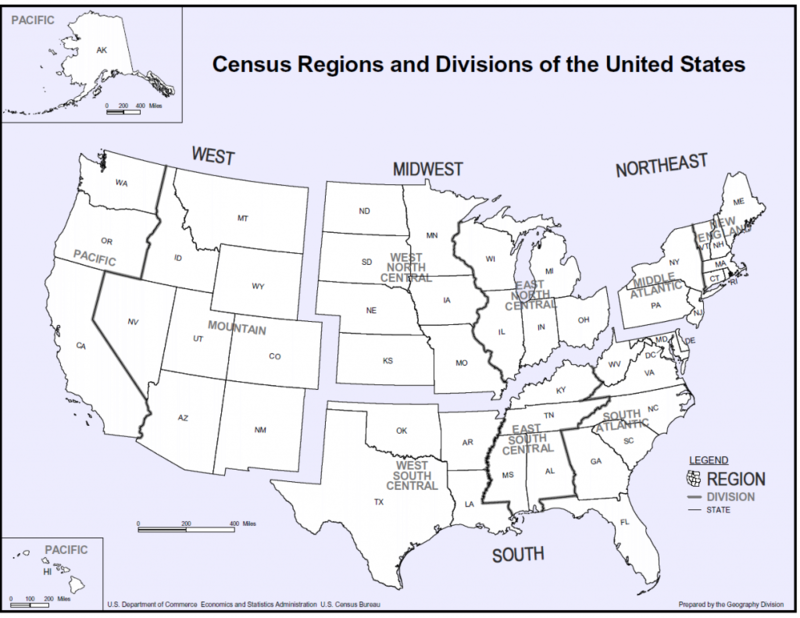 The Census Bureau divides into five regions. The Office of Management and Budget into 10 regions. 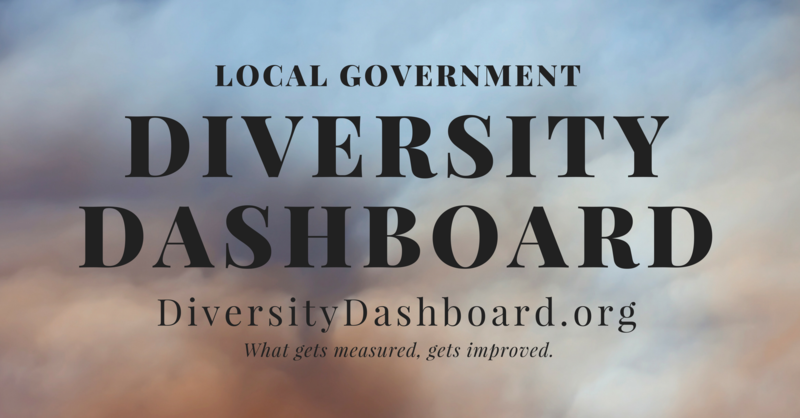 If government agencies have different ways of grouping the states based on geography, culture, or other factors, what regional set do we use here on the Diversity Dashboard? If we want to show where demographic representation is regionally mapped, maybe we go with the delineation used by the US Census, our country’s official demographic baseline. Further split into divisions, the US Census regional map allows for additional comparisons within each region. Now that we have our regional metrics set, we can start exploring trends…almost! There are a few more metric concerns to account for when we look at regional trends from Diversity Dashboard respondents. Survey response has overwhelmingly come from northeastern states. Northeastern states like Pennsylvania (with 2,560 municipalities) have thousands of more municipalities than western states. Nevada only has 19 incorporated municipalities. California only 482. Because of these state differences, we must average out the number of survey responses from the total number of municipalities in that state. This percentage of state response will be used to accurately explore trends as we start grouping states further for developing a regional and divisional narrative. Arguably the most important (and most tedious) part of demography research is establishing these types of rules and metrics; the more sound the evaluation framework, the easier it is to plug in data and gain sound insight. Join me next week for Regionalism Part 2 as we look at Diversity Dashboard responses with these contextual components in mind.